In 15 appearances at The Masters, Colin Montgomerie never really got to grips with the tricky and lightning-fast Augusta National greens. You could imagine his envy, then, at watching Jordan Spieth tame those surfaces over the past two years to start his career in the season’s opening major by finishing second then first. Spieth’s success on the greens here is why Montgomerie believes the American holds the edge over the two other joint favourites, Jason Day and Rory McIlroy, heading into an event that the Scot says has set pulses racing despite the absence of four-time Green Jacket winner Tiger Woods. “If you’re talking about The Masters, the one I like watching most [of the game’s current top three] is Jordan Spieth,” Montgomerie, who is on commentating duties for Sky Sports in Georgia this week, told The Scotsman. “I love to see the way his putts are holed in an aggressive manner. “The Masters is always 75 per cent on the greens and I love the way that Jordan approaches the putts at The Masters in that very confident way. Everyone can hit the ball; it’s the guy who can get the ball in the hole who wins The Masters. “I love watching the putting at The Masters because you can tell very quickly who has it and who hasn’t that week. In the build-up to recent majors, Montgomerie has always talked up McIlroy, believing the Northern Irishman would come out on top most of the time if he was at his best. On this occasion, though, he reckons it will be another “Sunshine on Spieth” storyline. “When he gets to the putting green and gets the bit between his teeth he will feel at home and think, ‘yes, I am better than anybody especially here because it’s the most difficult place to putt in the world’ and he’s the best, no question,” added the Scot. “He will come very, very close if not win it again because he is so strong on the greens and he seems to love it. The putts he has holed in the last two years and eight rounds have been phenomenal for a young guy. He has that confidence and authority on the greens. He will again be the man to beat – there’s no question. Spieth and Day, as well as other leading contenders such as Bubba Watson, Adam Scott, Charl Schwartzel, Louis Oosthuizen and Rickie Fowler, have all recorded wins in the countdown to this event. McIlroy, who comes here for the second year in a row with a chance to complete a career grand slam, is the odd man out. 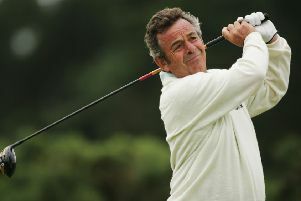 “I think the reason why he hasn’t won is because the competition is so damn good,” declared Montgomerie at the start of a season in which Sky Sports will cover all four men’s majors for the first time. “Jason Day beat him in the WGC Match Play semi-final; Rory didn’t beat himself. Jason went out and won that. No-one in the game requires more of that at the moment than Woods, who will be absent at Augusta National for only the second time since making his debut as an amateur in 1995. It’s still unclear when the 18-time major winner will return to competitive action as he tries to get himself fully fit again after a series of back surgeries. “There was a video sent by Mark Steinberg of him swinging in a simulator, but I’m not sure it was the date it was suggested it was. No-one is quite sure what’s going on,” observed Montgomerie. “It’s disappointing not to be kept in the loop as golf fans. Is he practising? Is he playing? If he’d been practising and playing for four or five months, surely he’d be ready to compete, so that’s not quite right. It’s all up in the air. “But we’re very fortunate in the world of golf that we have three guys coming into the first Major as joint favourites for the first time. There has always been one favourite but now there’s three. “Isn’t it great that we have those three who have taken the game forward in a very professional manner on and off the course?